This is the obligatory note from the author. Yes, it’s silly. Yes, it’s childish. But it’s tea. And it’s Neopia. What do you expect? Jahira Dune glared at the green kyrii sitting across the desk from him, who in his turn was glaring at the mug of rosy-pink tea that sat before him, its surface, mottled with dark maroon cones, rippling insouciantly. Jahira wasn’t herself one to argue; she was more of the meek type normally, but when it came to questioning her work, she managed to bring up a rivulet from the little golden sunlit pool of burning intensity hidden deep inside her. At this point Jahira Dune cracked. She turned and fled—or rather, stormed swiftly from the room in a tempest of raging frustration, which was her general mood anyway. Having done so, she left the building, slamming the door rather rudely behind her. That said and done, she stomped over the sidewalk and sat down hard on the curb, in front of a brown Uni who was apparently simply standing in the gutter. Jahira stared at her dark tan hands, which she had subconsciously arranged into a formidable pair of fists. The sunlight glinted off of the golden plates that adorned her body. Her ruby-encrusted collar was framed by a pale piece of cloth that hung down her neck from a small red-gold band on her head. Altogether, she created a blinding image, and after a moment of staring at the plates on her wrists she gave up with spots swirling in her eyes from the glare, and glanced over at the green Kyrii. Remnants of the reflection still hung in her eyes, blotting Tura a brilliant purple. “Why are you still hanging out the door?” Jahira demanded in a bad temper. And then, with that hurt, offended statement, he withdrew to his work. “Rokitu,” the Uni replied warily. “Well, if you want to leave at any time, go ‘head! Just... try, please?” Jahira pleaded. It didn’t take long for Jahira to get messages to all the major leaders, via the wings of poor Rokitu, but they had yet to actually meet. Jahira tracked down a decent place, which happened to be a cloud north of Faerieland. She set a date for the next day, since patience, to add to her all-too-long-already list of flaws, was not one of her virtues, and arrived about half an hour early, via, once again, the wings of poor Rokitu. “It’s not MY fault you wanted to come here so early!” Rokitu complained, kicking a stray piece of cloud petulantly. Jhudora showed up just then, cackling evilly in a (very, very, very cliché) puff of violet-and-poisonous-green smoke. “What are YOU doing here? !” Jahira demanded. “What about me?” asked a quiet voice as a second puff of purple smoke appeared on the cloud. “Not by yourself, no.” The Ruki stared blankly into space, waiting for something else to come along. Eventually, it did, riding a blue Uni. “Just give it a chance,” Jahira begged. Tura narrowed his eyes at her, plainly remembering the heated dispute over the thornberry tea. “Tura,” Rokitu murmured in warning, eyes jumping nervously to a Jahira who was getting increasingly impatient with each passing second. Jahira Sarandry Dune, female Desert Ruki, age something-or-other, Spokeswoman for Neopian tea companies, and immensely successful idealist, could hardly contain her glee. 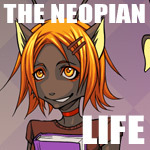 Neopian shoppers know no limits.